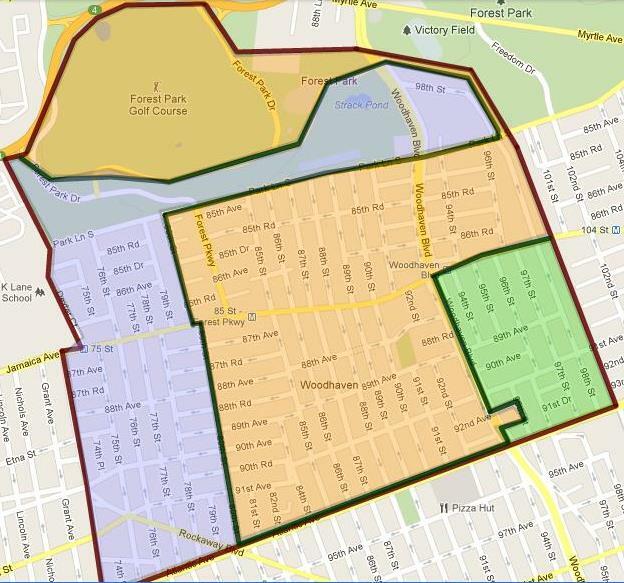 When it comes to the subject of redistricting, Woodhaven has been making it clear—not on their watch. At last week’s meeting of the Woodhaven Residents’ Block Association (WRBA), residents spoke out against the proposal from The Legislative Task Force on Demographic Research and Reapportionment (LATFOR) to redraw the boundaries of the 1.773 square-mile neighborhood. In recent weeks, the WRBA has taken a firm stance against the proposed boundaries, which are drawn by LATFOR, a legislative body appointed to redraw the lines for New York State Senate and Assembly districts. WRBA President Ed Wendell said recently that the issue had been a hot-button subject for the area because of the implications of what it would mean for Woodhaven on the political representation level. WRBA member Alex Blenkinsopp said the proposed state lines—which ultimately have to be approved by the Governor and state legislature—were unacceptable for several reasons. First, he argued, according to LATFOR’s map with the newly drawn boundaries, Woodhaven—currently represented by state Senator Joseph Addabbo of the 15th District—would be split among Addabbo and two other state senators. Particularly, parts of Woodhaven would be shifted to state Sen. Michael Gianaris, who represents the 12th District and is based in Astoria. As for the second reason, Blenkinsopp added, according to those lines, some Woodhaven residents would be in the same district as Astoria, while others would be in a district that would stretch into Green Acres Mall. WRBA member Maria Thompson said that under the plan, Woodhaven would lose Addabbo’s representation, which she commended. lines, but urging them to reconsider the plans to redraw the neighborhood’s senate lines. WRBA has argued that the plan would make it difficult for residents to know who is representing their districts and who to ask for help, according to the testimony. their neighborhood’s boundaries, they should contact state Senate majority leader Dean Skelos (R-9th District), who was last in charge of redrawing the state’s district lines; Skelos has previously stated his support of LATFOR’s plan in the press. “Contact Dean, and make it known that you want Joe Addabbo here,” he told residents. Skelos’ Albany office can be contacted at (518) 455-3171 and his Rockville Center office can be reached at (516) 766-8383; his email address is skelos@nyssenate.gov.